Is there a script that will open a hedged trade complete with TP, SL, & TS included? If so it would be much appreciated. I am looking for a system that will reverse my position each time price crosses an exact level (f.ex. 1,2345) can U help me finding it ? None of these work for me! If anyone can suggest a way to get these scripts to work. I am not an MT4 amateur, but I can't for the life of me get any of these scripts to run. They have been compiled and loaded onto the charts etc. Could it be my MT4 build? Anyone, please! 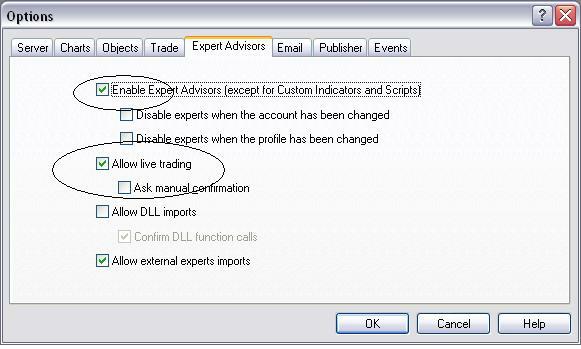 that could happend because the "allow live trading" option not seting. Thank you very much! it worked. I really like this feature to nab a couple pips in range bound late day sessions. Thanks! I meant If I attach your buy script to USD/JPY or any other chart...the script should always buy only specific symbol (eg AUD/JPY) irrespective of the chart to which the script is attached..
Can someone help me modify the code so I can place an order 2 - 3 pips under current market prices? I am using all of these scripts but sometimes I would like to place a limit order if it isnt moving ahead of me. Can one of you friendly coders give me a hand? Can the Stop and Reverse script be modified to use money management to open the reverse position? For example, to open a new position based on percentage of equity instead of the same size? This will also allow a stop be included with the new position since that is how the risk/mm is calculated. I have attached the script I currently use to open trades with this money management feature. Does anyone have a script that closes and reverses trades, but multiplies the lot size by a predetermined amount? There is one on MTQL4.com that multiplies lot by 2, but it's written in russian, so I can't modify or increase the lot size further to 3X or more. How does the money mgt feature work? I'm looking for something like this, but I'd like the mm to be pre-determined and coded into the script, so there is no lot size selection for the reverse order. Not sure if that's the case with your script.